After being humiliated and defeated by the Roman legions, Queen Boudicca, perhaps one of the most influential and powerful women in history, led an uprising against occupying Roman forces. She successfully defeated the Roman ninth legion and took down their capital. Her and her army then went on to destroy London, in which there were many fatalities. 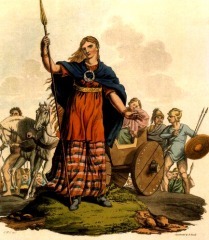 At the end of her reign, Boudicca was defeated by the Roman army, led by Paulinus. Her army destroyed, it was then thought that Boudicca poisoned herself to avoid getting taken by the Romans. Her legacy lives on because of her courage and determination to defeat her tribe's enemy, the Roman Empire.